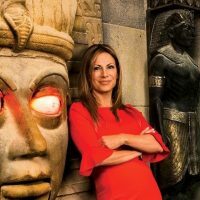 Ginger Flesher Sonnier is the founder and CEO of the Ginger Companies, LLC, providing Excellence in Experiential Entertainment with brands including Escape Room Live, Kick Axe Throwing, and THRōW Social. The Ginger Companies focus on providing the highest quality experience from start to finish in the exploding experiential socializing scene. By providing exceptional customer service alongside engaging activities in gorgeous venues, Ginger’s brands are built for longevity. With a major focus on large group events, each brand includes spacious lounge and reception areas with the feel of boutique hotels to cater to corporate clientele. Ginger is responsible for opening the first escape rooms in both Washington, D.C. and Northern Virginia in 2014, and the first urban axe throwing lodge in New York City in 2017. All of her venues are ranked number one on TripAdvisor and Yelp. Her latest concept, THRōW Social, combines unique ‘backyard-style' games with food & libations. It is slated to open in Washington, D.C. & New York City in 2019. Ginger and her brands have been featured in CNN, Late Night with Seth Meyers, VICELAND, Fast Company, the New York Times, the New York Post, TIME Magazine, WTOP Money News, Reuters, the Washington Post, the Washington Business Journal, New York Magazine, and Washingtonian Magazine, among others.